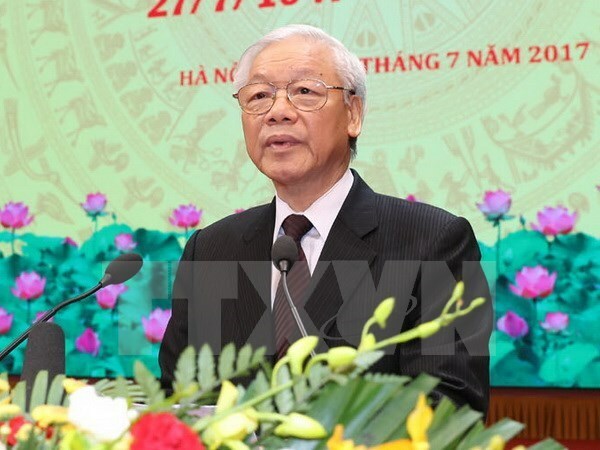 Hanoi (VNA) – Party General Secretary Nguyen Phu Trong’s official visit to Indonesia from August 22-24 will help strengthen political trust, consolidate friendship and boost cooperation, deepening the two countries’ strategic partnership. Deputy head of the Party Central Committee’s Commission for External Relations Nguyen Huy Tang said this is a historic visit in bilateral relations as it is the first visit made by a Party chief to Indonesia since late President Ho Chi Minh’s visit in 1959, and the first visit made by a top Vietnamese leader since the two nations established a strategic partnership in June 2013. The visit also aims to reaffirm Vietnam’s foreign policy of independence, self-reliance, peace, cooperation and development, and attaching importance to relations with neighbours and partners in ASEAN, he added. Vietnam and Indonesia established diplomatic ties on December 30, 1955. Indonesia is an important partner of Vietnam, while Vietnam is the only ASEAN country Indonesia has a strategic partnership with. They have inked numerous cooperation agreements, including memoranda of understanding on cooperation in fisheries and sea-related issues, agriculture and finance. Various cooperative mechanisms have also been established, including the bilateral cooperation committee at the foreign ministerial level, and a joint committee on economic cooperation. Vietnam and Indonesia are also stepping up collaboration in defence and security by maintaining a joint naval working group and establishing a hotline to share information on search and rescue activities.